With an endeavour to make gifts more creative and personal, Meraki makes quirky greeting cards, tags and gifting accessories which look like they’re straight out of an art book. They also have a small section full of hair ties and accessories. Meraki’s collection reminded us of the days of yore, when no gifts were handed out without an attached note or a greeting card. Created with a lot of labour and love, their handmade card collection includes laser cuts, colourful motifs and more. 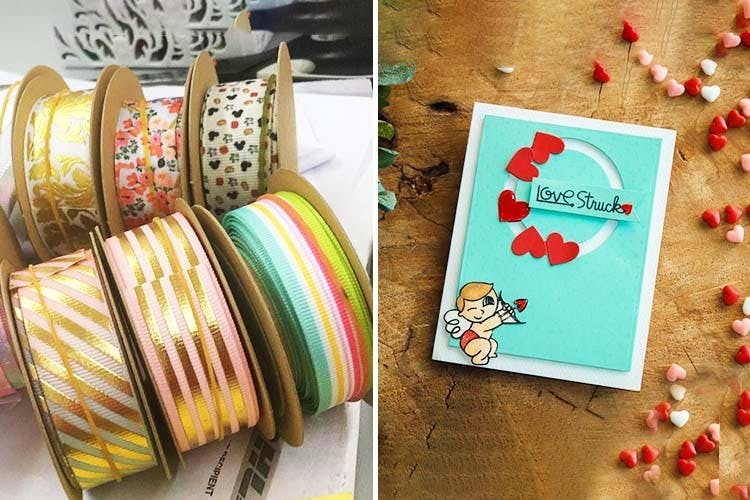 They’ve also got super-cute ribbons (both traditional and contemporary) available in different sizes, prints and materials, handmade tags, twine, crochet bows, gift bags, bookmarks and hairbands. If you need any customisations, they’re open to requests (if sent via email). Coming to the hair accessories bit—hair ties, clips, hair bands and bows are some of the things that Meraki offers at the moment. Their hair ties with cute polka dots, and in pastel shades, are great for those who don't like elastic bands that leave a crease (Meraki does 'no crease' ones). This brand's hair clips and hairbands with big colourful bows would also look super cute on kids (aunts in the house, check out their website now). Since some of the products are handmade (and not mass-produced), delivery may take time—especially If you’re making a bulk order. Also, we feel that the hair ties are a bit expensive. We say stock up on their offbeat ribbons and use them with a uni-coloured wrapping paper. They’re capable of transforming the look of any gift, and making it look gorgeous.